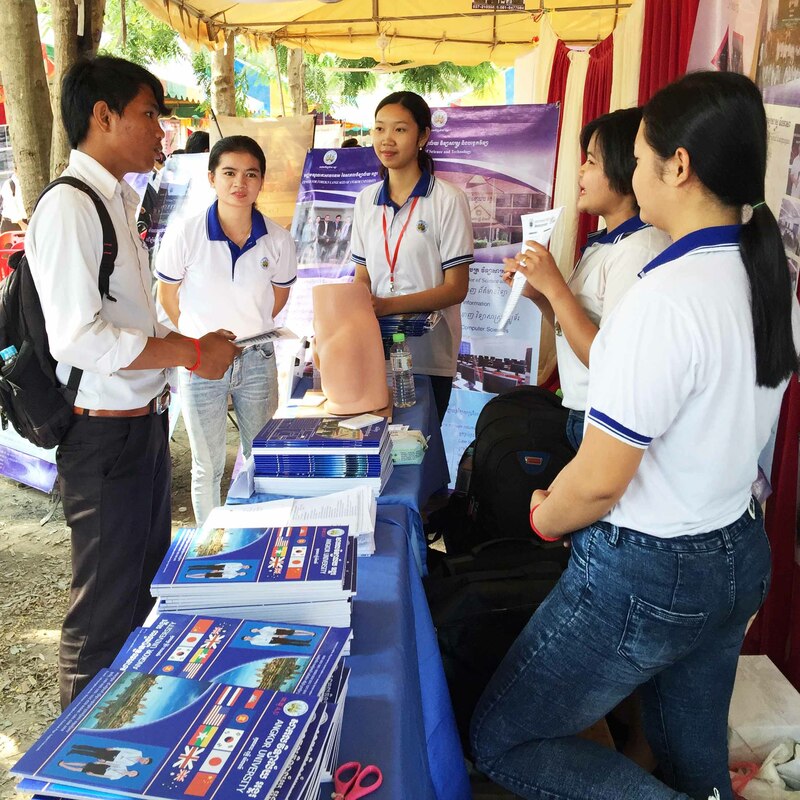 On 22 March 2019, PEPY’s Dream Management Project hosted the annual Skills Fair Event at Kralanh High School which aims to increase students’ awareness of opportunities after high school, including what kind of major they should pursue to fit with their dreams as well as current and future job markets, and connects them with future potential employers. 19 different universities, organizations, and local businesses participated in this event, including artists from Phare Circus, who missed their lunch break and stayed 2 hours extra to demonstrate their work and answer students’ many questions! There were approximately 500 participants including: students from grades 10 to 12, teachers, and representatives from the local department of education. All participants got to see presentations from each institution and ask questions related to their interests. 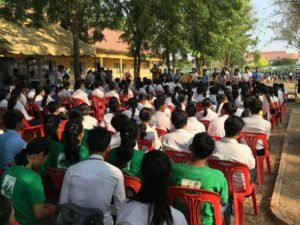 Moreover, they learned about available scholarships opportunities, university course options, and skills required by various employers in Siem Reap. Yat Simai, in grade 11, was very happy to be interviewed. “I am very delighted to meet friendly people from different institutions. They gave me a lot of information about jobs and subjects at universities. I have already planned to pursue work in the tourism industry, but after this event I gained a lot of crucial information so I can plan my future better. It really pushes me to reach my potential and go confidently in the direction toward my dream. I would like to express my sincere thanks to PEPY for spending the time and resources to plan this event for my school. This kind of event should be held every year”. Doeurt Deoun, an enthusiastic student in grade 10, found this event helpful in making some key decisions about her future. She said, “I have two possible directions that will lead me to achieving my dreams. One is to be a police officer and the other one is to be a front office manager. I spoke to representatives from different universities and hotels to seek more information related to my dreams, and they gave me many helpful recommendations on what I should do in order to reach my goals. This event helped me to think more about my future and I also got to consider other opportunities that may become my future destiny. I look forward to future skills fairs so that I can make sure I have heard enough about my opportunities for after high school. Thanks PEPY for this invaluable event. I wish everyone the best and success in their dreams.